« Exhibition Budapest – “Freedom Express” – European Network Remembrance and Solidarity. Herald News … Campus Festival – City of Debrecen – Hungary – 2015. July, 22.- July, 26. 2015. The heat is on … building up the venue to welcome the audience to Campus Festival 2015. Sharing the latest news to the forthcoming four days Festival at the North-East part of Hungary in Debrecen. Reaching the end to the full swing in building up the venue to welcome the audience to Campus Festival 2015. The venue is easy to reach from the city center even on foot or few minutes by tram or local buses runs to the on-site during the festival. The gate opens on Wednesday at 2 p.m., from that time campers may enter and occupy their place. The camp area is equipped with sanitary. More than four hundred musical, cultural, sporty, handicraft, and leisure activities awaits to get into the mood for the audience. There will be Hungarian bands performing on the major stages such as: Paddy and the Rats of the Lord, Deák Bill Blues Band, the Skafunderz Debrecen, Tankcsapda, Ákos, Magdolna Rúzsa, Quimby and Kowalsky and Vega, Vad Fruttik. Caro Emerald – jazz-pop diva from the Netherlands and one of the flagships of dubstep, Modestep also will be coming from the UK with live performance, similarly to the drum’n’bass dj Wilkinson and many more will fill the venue to be worthwhile to stay at the colourful programs. Beside the music varied gastronomic for empty stomach, nighttime movies out in the Great Forest, literary programs”, special play of lights on the building on the Water Tower. 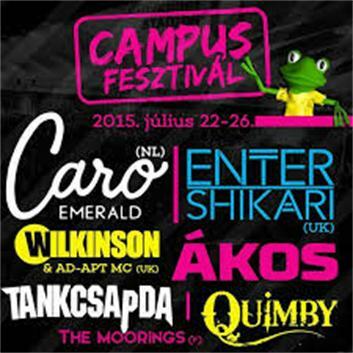 The Campus Festival is organised every year since 2002. Last year was recorded a record in having 70 000 visitors. On the spot tickets are available, such as the weekly pass for 4 days: 15990HUF. Ticket for one day entry cost 6990HUF. Ticket for Wednesday, before Day1 cost: 2990HUF.